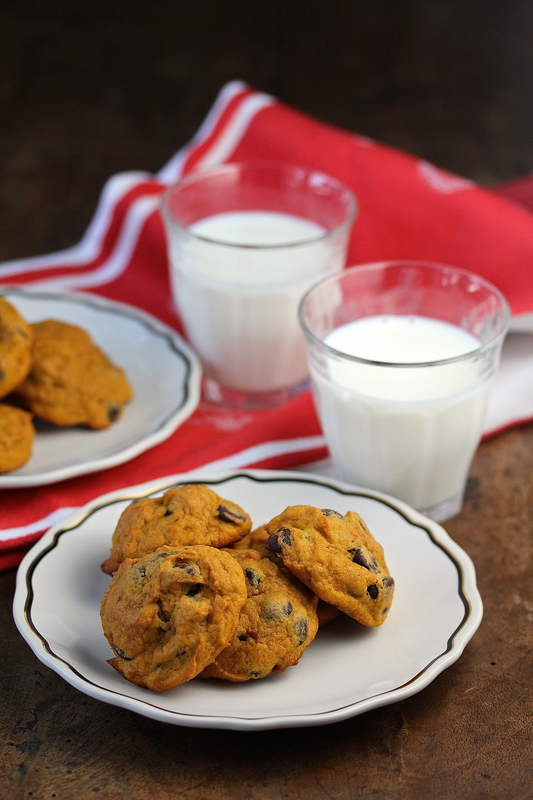 I am so excited about these Pumpkin Chocolate Chip Cookies. They are so amazingly soft and cake-like, and get better over time. They're pretty much pumpkin pie in a cookie.... with chocolate chips. They are easy to mix up, and come together in no time. They are fairly low in sugar, which makes them the perfect breakfast cookie. I offered some of these to my grandkids and they loved them. I also took a bunch of them to work, where they were a big hit. 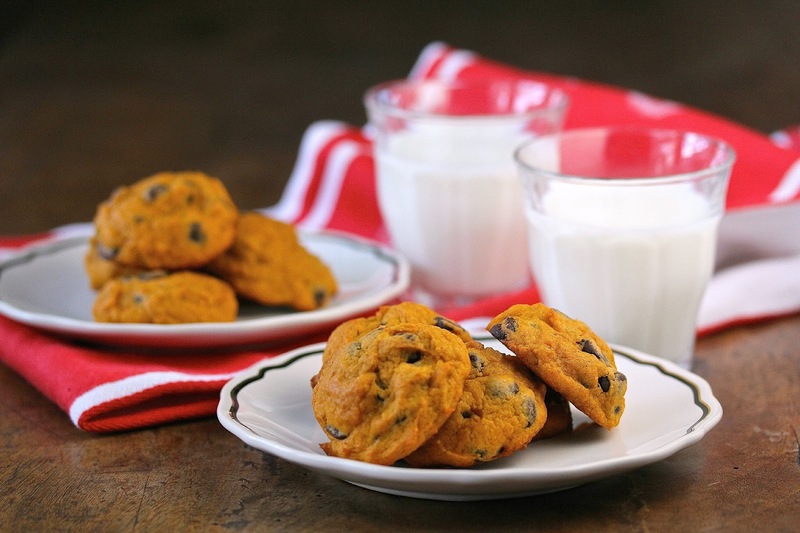 The pumpkin puree seriously adds to the softness and moistness of these cookies. The Creative Cookie Exchange bakers are baking cookies this month with a pumpkin theme. I decided to go super simple with these chocolate chip cookies. 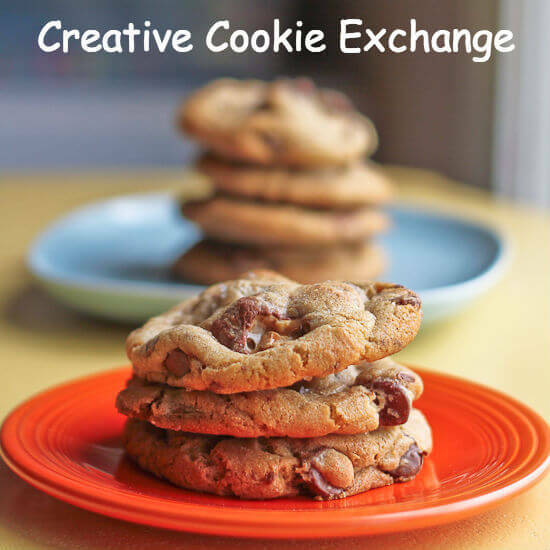 After the recipe, check out the rest of the #CreativeCookieExchange bakers. In a medium bowl, whisk together the flour, baking powder, soda, salt, cinnamon, and ginger. In the bowl of a stand mixer, beat the butter and sugars until blended. Add the pumpkin puree, eggs, and vanilla and beat until blended. Add the orange oil or zest, and briefly bead. Slowly add the dry ingredients while beating on low until incorporated. Stir in the chocolate chips. Using a 1 1/4 inch wide cookie scoop, scoop the dough onto the cookie sheets. Bake the cookies, one sheet at a time, for about 17 minutes. Let the cookies rest on the pan for about 5 minutes before cooking on a wire rack. Continue to bake sheets of the cookies until all cookies are baked. Store in an airtight container. They are actually better the next day. The theme this month is Pumpkin! It is only October--you can’t possibly be tired of this glorious symbol of the fall harvest yet! Love chocolate chip cookies of all kinds. Must try these ! Those cookies have a great color and perfect for this time of year. I love how perfect the color is! So inviting. Have to give these a go! These cookies look so thick and chewy! Yum! These cookies just look like fall and I bet they made your house smell good too. I love the fact that they are low in sugar & the thought of cookies for breakfast - yum! I love a cake-like cookie because it combines the best of both worlds! These look just right. Ooh, these look nice—almost like little pumpkins! Beautiful color and nothing beats a soft, cake-y cookie. I had some pumpkin chocolate chip cookies at a party last year and I LOVED them! I've never found the recipe so I might have to give this one a shot!